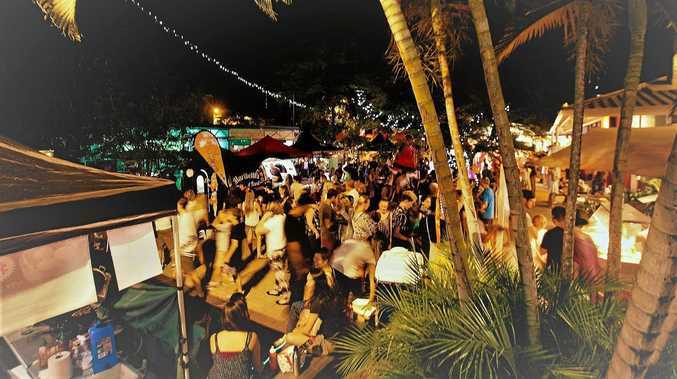 COME along to Noosa's only night market for an evening of street food and locally made products. From woodfired pizza to sweet treats, all your favourite food stalls and trucks will be there. And with drinks at happy-hour prices all night at the pop-up bar, it's a night not to miss. Listen to live music as you eat and wander the artisan stalls. Head to Arcadia St, Noosa Junction, from 5-9pm. HOP on board the Mary Valley Rattler steam locomotive this Easter with special holiday trains on Good Friday, Easter Saturday and Easter Sunday. Take a Noosa Country drive to Gympie Station where the historic train will depart at 10am for a three-hour return journey to Amamoor. Easter egg hunt and face painting for the kids. Bookings essential, see the website. BUSKING on the Noosa Boathouse lawn will happen every evening from 4.30-7.30pm until April 22. Bring the kids, friends or dog and come down to the Noosa River to enjoy the tunes. NOOSA Regional Gallery is holding a variety of children's workshops in the school holidays. Children can be creative with clay, sculpture and watercolour. Cost is $15pp. WHY not ease traffic and jump on a free Easter holiday bus in Noosa? Free buses for routes 626, 627, 628, 629, 632 and temporary route 064 between Peregian Beach and Noosa Heads will operate until April 28 thanks to Noosa Council and TransLink. There is also extra carparking in Noosa Heads Lions Park. Download the Go Noosa app for traffic information.